as well as Drivethru RPG, Spotify, and ApplePodcasts. Liberty: A.F.T.E.R. drops players on a distant planet where two worlds are at odds with one another. On one side of the wall the advanced military state of the Archon controls the lives of its Citizens, and on the other side post-apocalyptic gangs battle for the scant few resources the failing colony has left to offer. 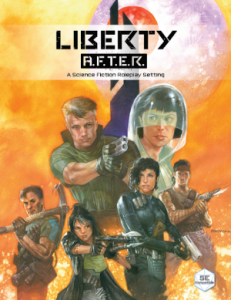 Much of the Liberty universe is based around the one city that is habitable, this is the first extensive story that aims to shake the established norms of the world. A detailed world that’s yours to customize. Submit your stories and they can become part of the world’s canon! Wayne June (Darkest Dungeon) – Game Master & Narrator. Peter Lewis (NoSleep) – Sylvanus Claerhaut – The lead investigator who is haunted by his past. Ashly Burch (Zero Dawn Horizon) – Thracius Wyatt – A disgraced soldier seeking redemption. Dave Fennoy (Walking Dead) – Sgt. Muler – The Chief Official over the investigation. Eric Nelsen (All My Children) – Gree – A religious zealot who seeks the destruction of Atrius. George Lowe (Space Ghost) – Sgt. Colliver – The last individual to see one of the missing persons. Tanja Milojevic (Organism) – Officer Boondt – A secret agent who seeks to slow the investigation. Sainty Nelsen (The Bay) – Agent Creed – A missing agent who is believed to have defected. John Dossinger Publishing is an independent, creator-owned publishing company. The team is located across six continents and aims to create diverse worlds. Fool and Scholar Productions is the creative team of producer Travis Vengroff and writer K. A. Statz. Together they create works of audio fiction spanning genres from horror, to science fiction, and more.